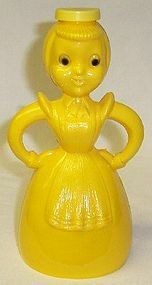 This is a really great yellow Plastic Sprinkling Bottle in the shape of a lady. This Bottle measures 6 3/4 inches high. It is in very good condition with no cracks or breaks. The original lid is very good. The color is all very vibrant yellow. 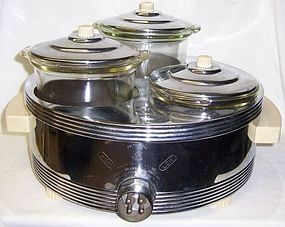 This would be a great addition to any kitchen collection. We guarantee all items to be as described. Feel free to email with any questions. THANK YOU. This really nice Translucent Green 4 1/2 Inch high Ribbed Syrup Pitcher was made by Anchor Hocking. 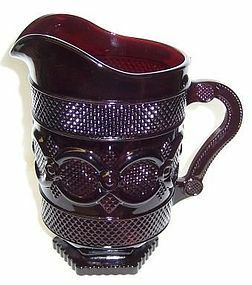 This Syrup Pitcher has a metal, hinged lid that works well. 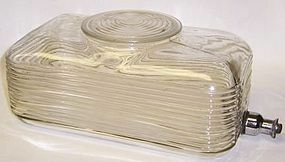 The glass pitcher is in very good condition with no chips, cracks or scratches. The metal lid is discolored. Be sure to search our other kitchen glass available. We guarantee all items to be as described. Feel free to email any questions. THANK YOU. 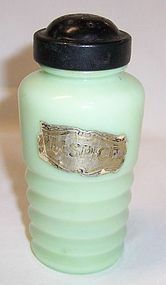 This is a really great depression glass green Tab Handled Orange Reamer or Juicer made by Federal Glass. This Reamer is in excellent condition with no chips, cracks, scratches. The Reamer measures 5 1/2 inches in diameter. The tab handle is signed with the FEDERAL shield. Be sure to search our other kitchen items. We guarantee all items to be as described. Feel free to email any questions. THANK YOU. This is a really nice Green Rest Well 5 1/4 Inch diameter Mixing Bowl made by Hazel Atlas. 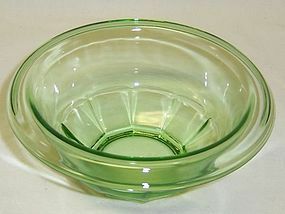 The bowl is in very good condition with no chips, cracks or scratches. Be sure to search our other kitchen items available. We guarantee all items to be as described. Feel free to email any questions. THANK YOU. This is a really great White with Red Drizzle 10 inches high, empty, Welch's Wine Decanter made by Hazel Atlas. The bottle is signed HA on the bottom. 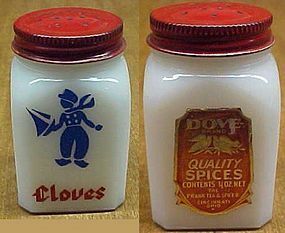 The bottle and original lid are in excellent condition. Be sure to search our other Hazel Atlas glass available. We guarantee all items to be as described. Feel free to email with any questions. THANK YOU. This is a really great 1993 Looney Tunes Cookie Jar featuring Bugs Bunny with a Carrot, mint, unused, in the original box. The Cookie Jar is signed TM. C. 1993 Warner Bros Inc. CERTIFIED INTERNATIONAL CORP TAIWAN. This Cookie Jar measures approximately 12 inches high and is in excellent condition with no chips, cracks or scratches. Be sure to search our other Looney Tunes items available. We guarantee all items to be as described. Feel free to email with any questions. THANK YOU. This is a really great 1993 Looney Tunes Cookie Jar featuring Tweety Bird, mint, unused, in the original box. The Cookie Jar is signed TM. C. 1993 Warner Bros Inc. CERTIFIED INTERNATIONAL CORP TAIWAN. This Cookie Jar measures approximately 12 inches high and is in excellent condition with no chips, cracks or scratches. 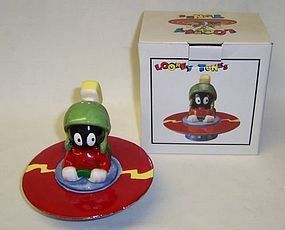 Be sure to search our other Looney Tunes items available. We guarantee all items to be as described. Feel free to email with any questions. THANK YOU.